Paddle Evasion invites you to come to enjoy a relaxing moment and to taste the pleasures of paddling ! 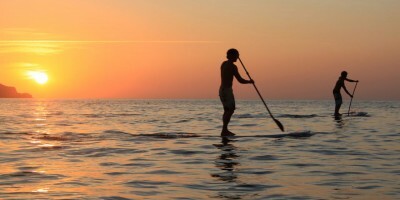 Discover the sensations of stand up paddle on the most beautiful sites on the French Riviera. Similar to surf or longboard, stand up paddle has its origins in the archipelago of Hawaii. The dimensions of the boards are adapted to paddling on the sea, which makes them stable enough for everyone to learn how to keep the balance in a few minutes. They have a compliant homologation to the 224 Division which allows you to navigate up to 300 meters from shore. Gliding through the water standing up on a paddle board, allows you to discover new sensations! 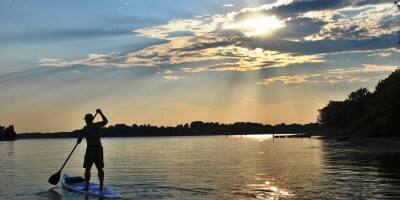 Stand up paddle is an entertaining and easy water activity, accessible to everyone who knows how to swim. From April to October, the Paddle Evasion team welcomes you with a smile. Rent a board for an hour or two – or why not a full day – with, or without, our state certified guide. We share our passion for stand up paddle on the most beautiful spots on the French riviera: Cap d’Antibes – Juan les Pins and Golfe Juan. Stand up paddle in Golfe Juan – Meeting point at the beginning of Avenue des Frères Roustan (when coming from Cannes). 10 meters from “Vallauris Beach”. Stand up paddle at Cap d’Antibes - Meeting point at the parking des Pêcheurs, just after the restaurant Les Pêcheurs, Boulevard Maréchal Juin, in Juan les Pins. Come and discover the sensations of stand up paddle on the most beautiful sites on the French riviera.